Rut Bryk graduated as a graphic designer from the School of Arts and Crafts in Helsinki in 1939, and started at Arabia in 1942. She was almost a stranger to ceramics when she started experimenting with the raw material that was later to bring her world renown. 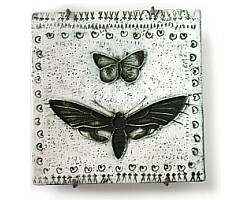 Her early decorative wall plaques show a magic world of imaginative flowers and fairies dancing in the woods. The colouring is luminous and light. Her faience plaques have a strange and strong glow. Her painted plaques in faience display intense colours due to thick glazing. 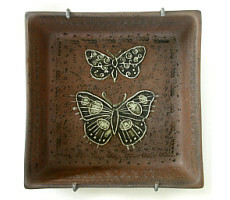 She also used glazing to enhance the depth dimension of the plaques. 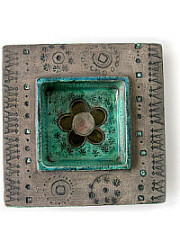 In the ”ceramic paintings” from the 1950s she uses delicate lines in relief to emphasise the motifs. Bryk’s imagery is an original combination of elements taken from the Byzantium, early renaissance, folk art and constructivism. In her early painted plaques she used everyday subjects in a manner remini- scent of icons. Geometric basic forms were used as additional decoration in the idyllic everyday scenes of the ’40s and ’50s, but since the ’60s they have been employed as subjects in their own right. Works designed in the ’70s and ’80s can be described as plastic architectural graphics. Rut´s huspand was one of Finland's most eminent postwar designers - Tapio Wirkkala.